The FotoFacial treatment is a non-invasive, non-ablative skin rejuvenation procedure that blends intense pulsed light (IPL) and bipolar radiofrequency (RF) therapy into an integrative technology called elos™ (Electro-Optical Synergy). This combination of therapies is designed to correct a number of skin imperfections, including: brown spots, freckles and sun spots, widespread redness, rosacea and red scarring, general sun damage and poikiloderma (redness, pigmentation, and a spotty look to the neck and/or décolletage), and uneven skin tone and texture. FotoFacial treatment from our experienced Central New Jersey facial plastic surgeon Eugenie Brunner, MD can help to decrease unwanted dark facial and body hair at the same time as treating pigment irregularity. This method can also help to reduce acne, fine lines, and pigmented stretch marks. Laser and light treatments can be especially effective at improving the appearance of the face, neck, chest, and hands. The result should be smoother, brighter, and healthier skin! For more information about our FotoFacial or IPL treatments, or if you wish to schedule a consultation with Dr. Brunner, please contact our office today. Elos is a proprietary technology utilized in our FotoFacial RF treatment that combines the benefits of IPL and optical energy with that of radiofrequency energy. It is designed to correct an array of skin conditions as well as provide overall facial and body rejuvenation. By directing a pulse of energy containing both a higher level of radio frequency energy and infrared light, the elos technology can often reduce the appearance of wrinkles, tighten skin, and minimize discoloration with greater results than with IPL-RF alone. The FotoFacial RF device sends pulses of the two energy types into the skin, synergistically helping to reduce or eliminate brown spots, blood vessels, redness, and other blemishes. The radiofrequency energy also aids in producing natural collagen and elastin deep within the dermis, which can help to smooth irregularities of the skin and reduce fine lines and moderate creases. In addition to enhancing skin quality, the FotoFacial RF also targets melanin and hemoglobin, which contribute to the color in hair, skin, and blood vessels. As the light is absorbed by the treated area, it turns to heat, which in turn destroys the targeted cells. The light will not harm the skin’s surface; however, it is designed to activate the body’s healing process. In the case of lesions, the marks will first turn dark before either peeling off or being absorbed by the body. Dr. Eugenie Brunner, our experienced facial plastic surgeon, performs the non-invasive FotoFacial RF rejuvenation treatment in her office. She will begin the procedure by applying a thin layer of an aqueous non-gel medium to the area to be treated. 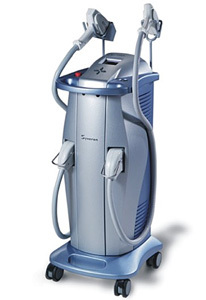 This substance helps conduct the RF current into the skin; it is not intended to provide a cooling sensation; however, the FotoFacial device is actively cooled to help protect the skin. Once the non-gel solution is administered to targeted areas of the face and body, Dr. Brunner will treat the skin with gentle pulsations of the elos system. The procedure typically lasts approximately 30 minutes, and most patients will require a series of three to six treatments, scheduled every three to four weeks, to optimize the effects. Microdermabrasion may be recommended between appointments for certain skin types, as it can help to enhance the skin’s absorption of energy. Recovery from FotoFacial RF treatment is typically minimal. Some patients experience mild redness, which often subsides within 30 minutes to several hours. If desired, makeup and moisturizer may be applied following the procedure. Dr. Brunner advises all patients to wear sunscreen daily to help prevent sun damage and to help extend the benefits of the rejuvenation.